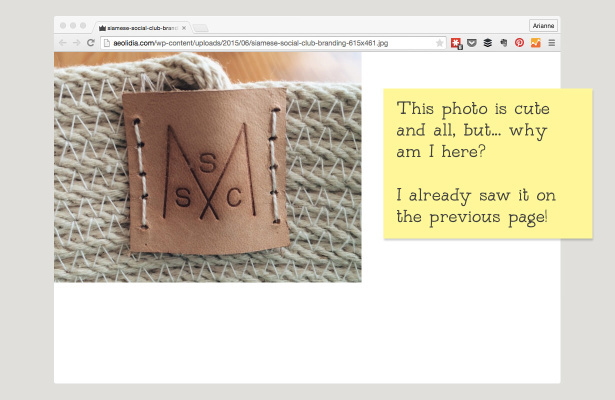 You want to look like you know what you’re doing, but is your blog plotting to make you look like a fool? I see these same content and technical mistakes on blogs over and over, and most are easy to fix. 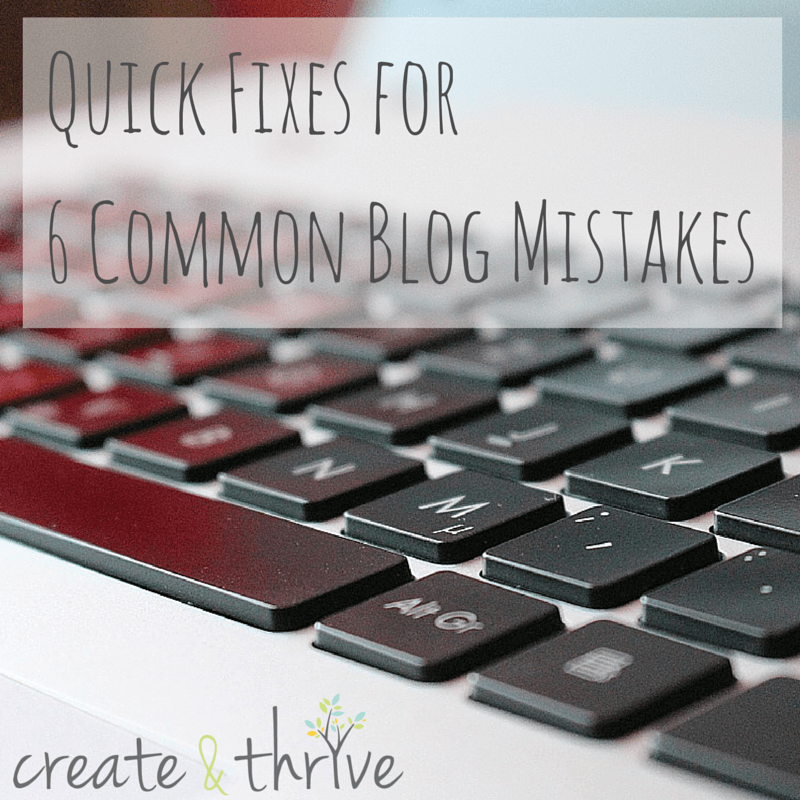 If these common blog mistakes have been driving you crazy on your own site, I’ve got some tips for you today. My fixes use WordPress menu names, but most blogging programs will have similar functionality, though perhaps tucked behind a different menu. This is a common problem with a simple fix. As a reader, I see a photo in a post, and notice that when I hover over it, it’s a link. Expecting to either get a lightbox-style pop-up over the screen with a larger photo, or at least be taken to the larger photo directly, I click, and I get… the exact same photo at the exact same size, but on a blank page. Now I need to click my “back” button to get back to what I was reading. When you’re adding the image to your post, make sure the “link to” choice is set to “none” in WordPress. WordPress will remember what you did last time, so it’s always good to check the setting for each new image, rather than assuming it’s set how you want it. It irks me when I’m reading a blog and the photos don’t take advantage of all the width of the column they’re in, or when photos are all different sizes throughout the blog. Always upload images that are as large or larger than the space you have. 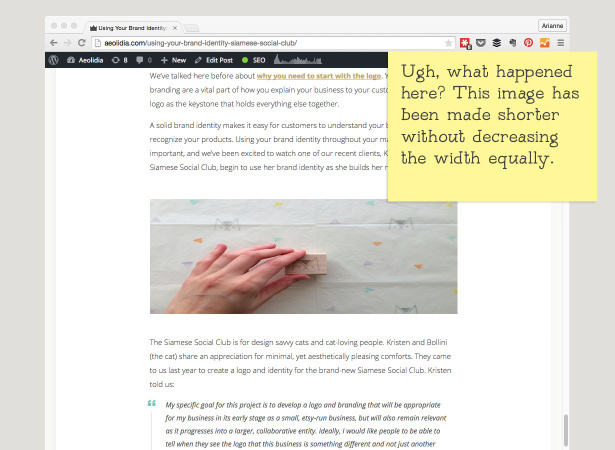 Sometimes this isn’t enough, though, as your WordPress admin might be set up to size and display photos smaller than they are. 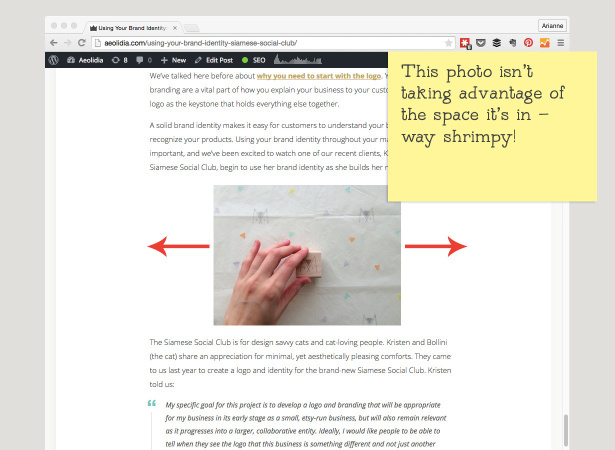 If big photos turn small when you add them to the blog, you need to adjust some settings. Find out how many pixels wide your photos need to be to fill the space available. There are a lot of different ways to do this, none of which are quick to explain, I’m afraid. Ask your friendly web designer friend (me)! Now that you know how wide you want your photos to be, make sure WordPress is set up to help you with that. Go to Settings in your WordPress admin and choose Media. You can set three standard sizes, and then you’ll be able to choose from between them whenever you upload a new image. Your small size could be used for thumbnail graphics that lead to posts, your medium could be the photos in the posts, and large could be the size people see when they click to view it larger. It’s weird to come across a photo that’s obviously been stretched or squished, like a piece of chewing gum. You are probably changing the height or width of your image without changing the other side. For instance, if your image is 400 pixels wide and 400 pixels tall, when you change the width to 300 pixels, you need the height to change by the same amount. The fix for this depends on where you’re having the problem. If the problem happens when you edit the photo, be sure that when you change the width of an image, the height is also changing proportionately. This would be in Photoshop or whatever other photo editing software you use. If your photos look fine on your computer, but then look crazy on your blog, check your media or file upload settings to make sure that they aren’t automatically being resized on one dimension only. If you want your comments section to be lively, it’s always best to have a discussion going as quickly as possible. Holding comments to be approved manually by you slows things down, and in the time it takes you to click and approve a comment, people may have missed out on the opportunity to discuss. 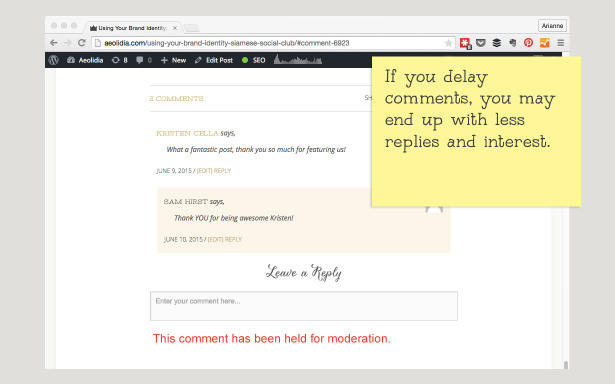 Allow comments to flow freely on your site, unless you begin having a problem that requires you look at each comment individually. This is under Settings > Discussion in WordPress. As soon as your site is ranked in Google and starts getting traffic and interest, spam robots will flood it with tons of garbage comments. Letting these pile up on your site is bad for business, and spending all of your time manually deleting them is a waste of your time. Pay Akismet $5/month to wipe this stuff out before it even makes it to your blog. If you spend more than 5-10 minutes per month tackling spam comments, I’d say this is money well spent. WordPress gives you so many handy dandy widgets that it’s super tempting to fill your sidebar up with lots of neat looking goodies. However, clogging your sidebar with clutter will just cause visitors to ignore everything they see to the side of the real content, and you will have lost the opportunity to make your blog an easy place to explore, or to promote what you most want people to know about. 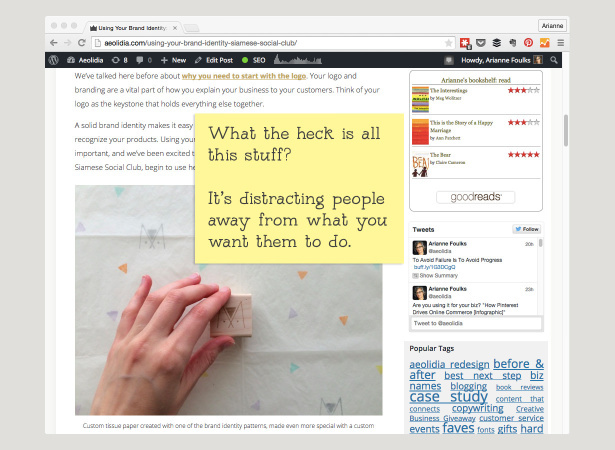 Edit your sidebar ferociously. Look at each thing you’ve added, and ask if it’s something your reader needs, or if it helps you with your business goals. Remember that the more distractions you give your reader, the less you’ll be able to guide them through your site to your ultimate goal (purchasing your products, signing up for your service, etc.). I share many more tips like this in my Aeolidia newsletter. What mistakes do you see on blogs that drive you batty? What questions do you have about your own blog? P.S. 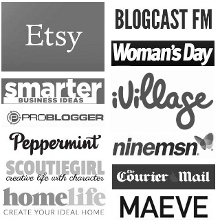 If you missed my post with 260 blog post ideas, that’s a good place to get started on improving your blog!